DREAM INDIA TECHNOLOGIES: 1st Floor, Above Ampere, OPPOSITE PROFIT SHOE , 4/1 Arundelpet, Guntur, AP-522002. 7331194359. 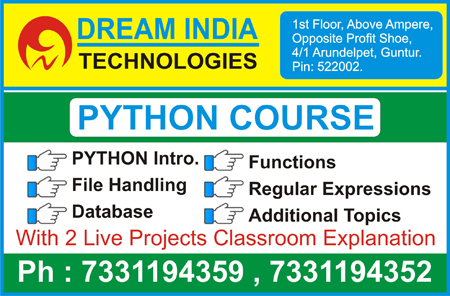 Dream India Technologies Offers Job oriented and Placement Focused Python Course training Institute in Guntur. Our Python course content created by industry experts to full fill industry expectations. Such detailed Python course helped our students to secure job in various MNCs. The trainers at Dream India Technologies are subject specialist corporate professionals providing in-depth training on Python course in Guntur. We are one of best Python institutes in Guntur. Fallow Us: . Python was created by Guido van Rossum in 1991. Python is an interpreted, object-oriented and high-level programming language with dynamic semantics. Python is a powerful Open Source and Object Oriented Language. Python is easy to learn, easy to use, and has powerful libraries for data manipulation and analysis. Python is a scripting language mainly used for Web Programming. Python also used for developing desktop applications. Normal Track: 45 Days, Fast Track: 30 Days. Python Course Fee: 3500 Rs. Copyrights 2018 - Dream India Technologies - Web Designing, PHP, Autocad, Ms Office, Tally, C Language, .Net, Java, Oracle Training Institute. Arundelpet,Guntur.